My sweet boy turned 6 earlier this month. I can hardly believe he has less than a month left of Kindergarten. It has been such a wonderful year of growth not just for him but for us as parents too. We always host a birthday party for him at home, which is certainly a celebration of him but also a chance to get together with our extended family and a few close friends. It is always a full house and there is always lots of good food. This year, I wanted to make The Birthday Cake from Christina Tosi at Momofuku Milk Bar. It looks like a process, and it is, but an incredibly fun one. I so enjoyed putting it together. 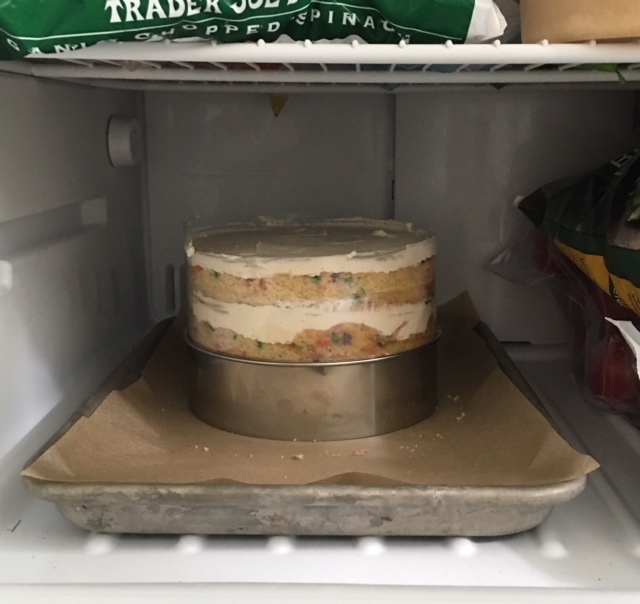 And the technique of using a cake ring to cut the layers, acetate to build up the side frame and the freezer to set it is genius. I want to make all my layer cakes this way. It's fun and they look incredible. Also inspired by Christina Tosi, I made a version of her Haute Dogs. However, I used Julia Turshen's foolproof and truly all-purpose yeasted dough recipe from her cookbook Small Victories. I've mentioned her cookbook here at least a few times as it is such a great one. In the cookbook she uses the dough recipe to make 12 raspberry jam buns. I used it to make 12 hot dog rolls (in fact I tripled the recipe to make 36) instead. I also used my stand mixer to initially mix the dough, then kneaded it for a few minutes as instructed. Then I put all three batches into a cambro, covered it with a towel and let it rise for about an hour until doubled in size. I punched it down, covered the bowl with the lid and stuck it in the fridge overnight until I was ready to make them the following morning. I slathered a mustard butter on each roll and added this red onion jam before rolling them up and baking them. I piled them high on a sheetpan to serve and they were devoured by kids and adults alike. I also made this great onion dip from Alison Roman served with classic ridged potato chips, a simple and bright cabbage slaw and a quadruple batch of these long time favorite salted brown butter crispy treats from Smitten Kitchen (though I more than double the Maldon sea salt it calls for). I made them to bring to my son's school on his actual birthday to share with his class. Three things in particular make these incredible. They are inspired by the technique of the snickerdoodle with the addition of cream of tartar. They have an incredibly long creaming process (a Milk Bar signature) about 10 minutes total. And the addition of milk powder which Tosi says adds chewiness as well as a depth of flavor. Full of sugar, dairy, gluten and artificially colored sprinkles! But for a special treat, I'd have a hard time passing up one of these. It is spring break this week and while most people we know made a mass exodus out of Seattle in search of sunshine (who can blame them) we are having a rather stellar staycation at home. Both my husband and I took the week off. I've been catching up on reading and when I haven't been reading I've been cooking and baking. Another bright spot has been a visit from dear friends who live in Lake Tahoe that we haven't seen in a few years. When we get together it's like no time has passed. The company and conversation is always easy and there is always laughter. We also drank a few rounds of my "house margarita" which includes my most favorite spirit, mezcal. Yes, yes, and yes. *A note if making these for a crowd - I learned this tip from Julia Turshen. Simply quadruple this recipe (or more if you have a big crowd) and just whisk it all together in a big pitcher. Chill in the fridge until ready to serve and then pour over ice. I roasted chickens instead of turkey. There was stuffing with lots of fresh herbs, mashed potatoes and Ina's gravy. Today, we were ready for a quiet, lazy Sunday. We slept in and stayed in our pajamas all day and I made this really lovely lentil soup which I will definitely be making again. The holidays are here. Now it's time to do a little shopping. It felt so good to create some space and limit the amount of "input" I was exposing myself to so I'm going to keep it going. I deleted Instagram from my phone so I wouldn't be tempted throughout the day to pick it up and just mindlessly flip through. Instead of NPR and the NY Times, I've been listening nonstop to On Being. I've been trying to write a post about Krista Tippett and On Being for several months (and I mentioned it back in September). I still can't find the right words, so again I'll just urge you to start listening. If you have never made homemade stock before, it is so easy and the reward is rich. You can always trust Pamela Salzman. Find her basic chicken stock recipe here. I love PCC which is where I do nearly all of my grocery shopping and in the freezer section in the meat department you can find organic chicken backs/bones and even chicken feet which are stellar for stock and all super affordable. Next up on my to do list is pie dough. Also, it's good to know that flour goes rancid quite easily. Fresh flour pretty much has no smell. If you open up your bag of flour that has been sitting in your cupboard for several months and it has a distinct smell, it is bad. You might even think that that smell is what flour is supposed to smell like. Dump it. If you live locally, find Stone-Buhr flour from the good people of Shepherd's Grain at PCC. Also if you are like me and don't often use AP white flour, you might want to store it well sealed in the freezer to prolong its life. With all that has gone on in the last few weeks, I am hopeful, and I am grateful. If anything I think many of us have replaced a sort of complacency with a new sense of ownership in our lives asking ourselves, "What can I do?" Where to begin? Open your mind and your heart and your eyes to others around you. When you are waiting in line for your coffee, or sitting alone at lunch, whatever it is, resist the urge to look down at the device in your hands and instead lift your head up and appreciate the humanity that surrounds you. With immense gratitude, have a wonderful Thanksgiving. Hands down, this is the best ever carnitas recipe. You will make this over and over for your family and easy summer get togethers with friends not only because it is so utterly delicious, but because it is so incredibly hands off and easy to prepare. The recipe came to me originally from a class at The Pantry a few years ago. The cool thing about the process is that it is a reverse braise. Generally when braising meats, you sear a large cut (generally a tougher cut) of meat, then lower the heat and simmer it low and slow in liquid for a few hours and the result is magic. Tough cuts break down and become tender, moist and flavorful. With the reverse braise, you skip the searing part. Cook low and slow first, then remove the lid, bring it up to a boil, cook off the liquid and the meat crisps on it's own. The result is also magic - tender, moist and flavorful but with a crispy, charred outer edge. Cut the pork into 2-3 inch chunks. Combine everything in a large pot and bring to a boil. Reduce heat, cover and simmer until pork is tender and the fat is liquefying, stirring occasionally, about two hours. Uncover and boil the pork until the liquid evaporates and the meat browns and begins to crisp, stirring often. This should take about an hour. For reference, the photo below was taken with about 20 minutes left to go. It won't look pretty and you might wonder if you're on the right track. Don't worry, just keep stirring regularly. And soon it will be crispy and perfect like this. It is delicious served with corn tortillas, a little avocado and some shredded cabbage tossed with lime. Or just enjoy it as I did tonight next to a fat slab of avocado sprinkled with Maldon sea salt and cilantro, and some pickled red onion. They are also great as leftovers, just crisp them up in a fry pan...though they never last that long at our house. We had the pleasure of meeting Jon and his partner Shira a few years back. They are incredibly magnetic and thoughtful and they happily answered all our novice wine tasting questions which evolved into an impromptu tasting of reds, whites and bubbles, ultimately showing us how to taste and be able to discern what you like. And what a writer he is. Read more about Rimmerman and how Garagiste came to be in this NY Times article from 2012. How can you go wrong with something named "Tequila Healer"? Ginger, mint, citrus and tequila. Print the recipe here. And if you're in need of a good bottle of tequila, Casamigos would be a really good choice. That small, simple speaker above is a Jambox. It may be small at only six inches, but the sound is incredibly clear and worthy of supplying the music for your dinner party. It is also wireless, using bluetooth, which makes it utterly portable and versatile. I've long followed Remodelista, a "sourcebook for considered living" and I love their tips for being a good host during the holidays. Two of my favorites: 1. Declutter, declutter, declutter. Reining in chaos around the house is never a bad idea. Before your guests arrive, vanquish piles of clutter: if it’s useful or beautiful, keep; otherwise, toss. You and your visitors will be more comfortable. 10. Allow plenty of time for holiday decompression. Remember that a good host allows space for the guests to do as they please. For your visitors, as well as for yourself, take time this holiday to simply relax, restore, and renew. You can read all ten here. They also have a beautiful new book.